Nominees Selected for First Democratic Debate. Will Hickenlooper Make it? In about 10 weeks, the Democrats host their first debate (June 26-27, 2019). There are 18 announced candidates, and a dozen are raising money and have some awareness, if slight, among the Democratic electorate. Those are the two criteria to get onto the debate stage. John Hickenlooper has hit one percent in the national polls (not consistently), but his fundraising is lagging behind the top candidates. He raised $2 million in the first quarter, with only modest amounts of it from online contributors. He might argue that it at least puts him in the top eight, even if at the bottom. Does Mayor Hancock get to 50 percent and avoid a runoff or are 60 percent of the voters looking for change, at least in the first round? If it’s change, which of the three leading challengers will be ahead on May 7? Penfield Tate knows Denver, has a good reputation and seems ready for the job. 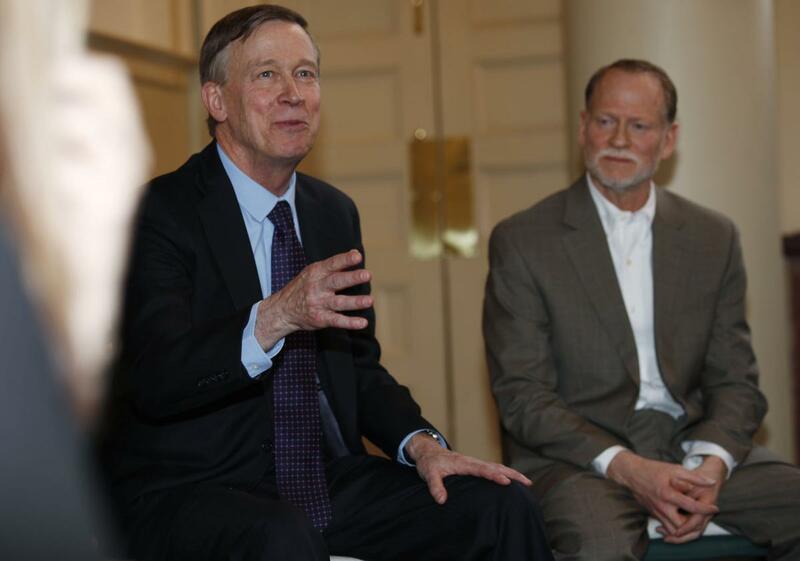 Tate believes Denver’s quality of life is slipping away. If voters want experience and a long political track record, Tate wins. Lisa Calderón represents the most dramatic amount of change. A true outsider who will take on the system. If voters believe a major shake-up is needed, Calderón is the candidate. Jamie Giellis has less government experience or local knowledge, but has new ideas and a track record of solving development-type problems. Is she the new ideas candidate that appeals to Millennials? Even if Hancock doesn’t get to 50 percent, the race is not over. Both Federico Peña and Wellington Webb recovered in run-offs. In fact, challengers beat them (Don Bain and Mary DeGroot, respectively) in the first round, but they still managed to win. Is Hancock in for a Runoff? Although no polls have been published, it is clearly a disruptive moment to be running for a third term as Denver mayor. Michael Hancock has been successful by many definitions. The city attracts new residents, the economy is strong and he has passed ballot issues overriding TABOR and approving infrastructure bonds, usually a sign of public support. 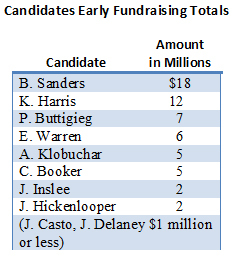 In the campaign, the most reported metric is fundraising, and Hancock holds a million dollar advantage over his opponents. In general, incumbents are not defeated. But, there are a few exceptions. 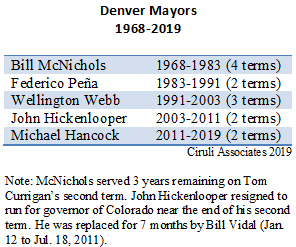 The modern era of Denver politics began in 1983 when Federico Peña defeated Bill McNichols, who was going for a fifth term. And, both Peña and his successor, Wellington Webb, had very tough second term re-elections where they lost the first rounds. And, there is a sense 2019 will be a difficult year for incumbents. Chicago just tossed out the machine for a political novice advocating change and fighting corruption. Although none of Hancock’s opponents have surged yet, all three are actively campaigning, have constituencies and together only need to hold Hancock to below 50 percent. Hancock’s biggest issue challenge is growth, which the booming economy has encouraged. He is the establishment and business candidate as the fundraising makes clear. He gets credit for much of what is exciting about Denver, but now he gets the blame for the traffic, gentrification, homelessness and other less welcoming side effects of growth. Also, like 1983 when Baby Boomers helped elect Peña, the surge of new Millennial voters don’t know Hancock’s life story or his record of service. He’s had to introduce himself with advertising to this new electorate, who ironically represent the growth the public is concerned about. Japan is an economic power – third largest national GDP after the U.S. and China – but it has not projected strategic influence. Prime Minister Abe, his party the LDP (Liberal Democratic Party) and the nation’s foreign policy leadership are changing that. 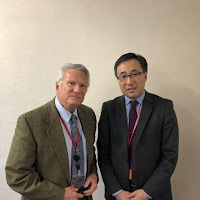 They recognize new circumstances in the last decade have created challenges in the Western Pacific that, if not addressed quickly, will become strategic threats that could harm the nation’s and region’s security and prosperity. Recent visits with leading Japanese foreign policy experts confirm the new direction. 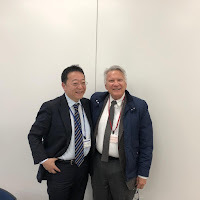 Tauneo Watanabe, senior research fellow of the Sasakawa Peace Foundation, and Hiroyuki Akita, foreign affairs and security columnist for the Nikkei: Shimbun recognize the challenges that the Abe government is addressing. The long period of relative calm in the Pacific has been disordered by the rise of an expansionist China. With vast economic resources and leadership of Xi Jinping, it is revising the region’s power relationships and rules. North Korea, long a repressive rogue state, now has nuclear weapons and a delivery system that could reach Japan and beyond. The new leader, Kim Jong-un, appears determined to change his country’s economic and strategic weakness. But, probably the most unexpected and rapid change has been in the U.S.’s foreign policy under President Donald Trump’s “America First” doctrine. Alliances, including with Japan, South Korea and other Asian nations, have been discounted as they are primarily considered financial arrangements subject to unilateral revocation and accompanied by frequent, if casual, threats of withdrawal. Japan’s pacifist constitution (war making is prohibited), which has broad public support, will likely remain the dominant foreign policy boundary, but Japanese realists are increasingly redefining it to address the new conditions in the Pacific. Abe’s strategy is to use soft power to build multilateral alliances dedicated to economic benefits with selective, if limited, military applications. So, for example, Abe has picked up the TPP trade agreement discarded by the Trump administration and reconfigured it. He recognizes the U.S. must be a part of the trade and defense strategies and has encouraged the U.S. to rejoin the revised TPP and Japan is taking part with the U.S. and South Asian nations in military exercises. He and his foreign policy team are also looking farther afield for allies, including in Europe, for example Germany, and in the Mideast. Fortunately for Abe’s timing, Japanese soft power in the Pacific Rim is high. 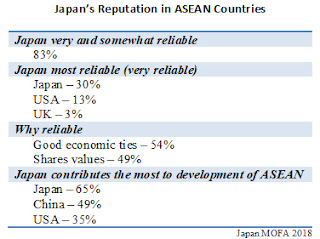 A couple of recent polls show Japan’s reputation exceeds China’s and the U.S.’s in a number of Asian and South Asian Rim countries. It reflects many years of work on soft power with economic development, cultural exchanges and tourism promotion. 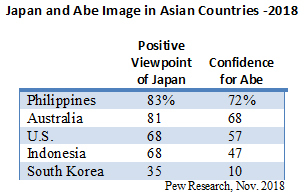 A Pew Research survey of last November shows confidence in Abe and positive reviews of Japan in the Philippines, Australia, U.S. and Indonesia. Only South Koreans are negative. A survey commissioned by Japan’s Ministry of Foreign Affairs in ASEAN member states in February 2018 (3,000 interviews in 10 countries). Japan’s leadership sees defense of a rule-based international system and the self-confidence of democratic counties as an important national objective and a responsibility it shares with the U.S. and other allies. There is good reason to believe Donald Trump is wrong that the Mueller report provides “complete and total exoneration,” which he proclaimed returning from Mar-a-Lago the Sunday after Attorney General Barr’s four-page letter to the Congress (March 24, 2019). It is also clear that he is aware of the problems the report presents as he has backed away from his original position of releasing the report. 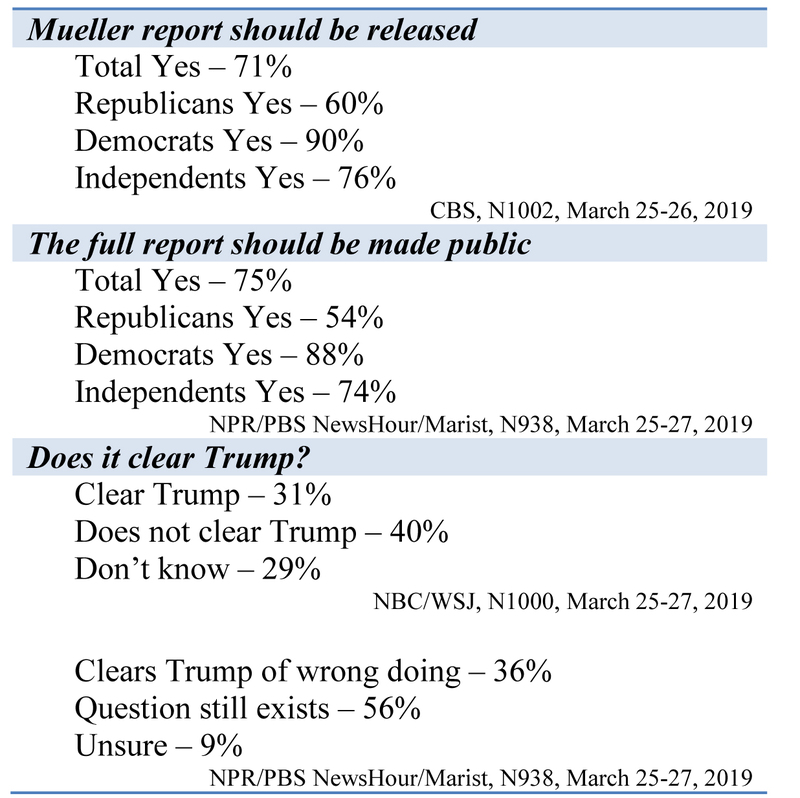 President Trump is right to be concerned as a careful reading of Barr’s summary of the 400-page report highlights that there may be ample evidence of both collusion-type activities (but no tacit or express agreement) and obstruction (“It also does not exonerate him”). 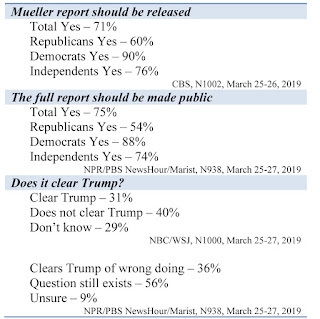 The American people appear in early polls to agree there’s more to the story and they want to see the report to get it. Kirstjen Nielsen joins her former boss, John Kelly, as pushed out (fired) by Donald Trump for not being tough enough. With asylum seekers increasing and illegal border crossings continuing, Nielsen’s job became impossible. Trump is also looking for a new “tougher” ICE administrator. 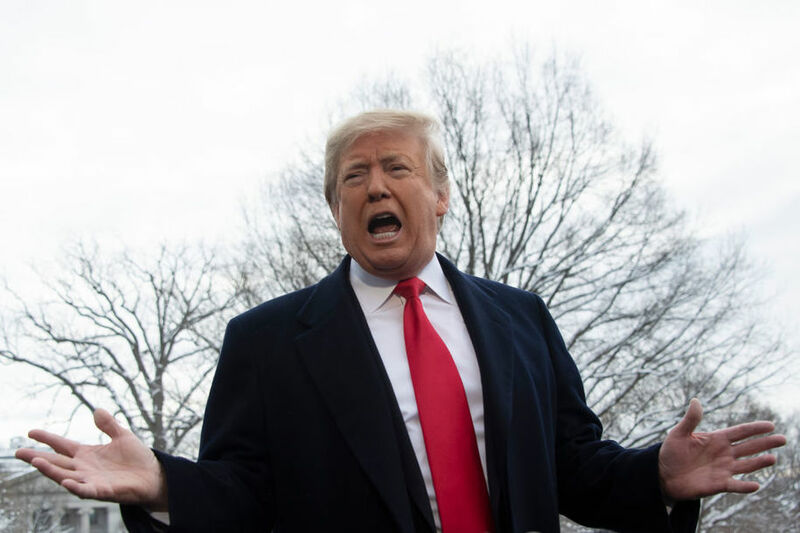 President Trump, who used anti-immigration policies and rhetoric in both the 2016 and 2018 elections, is seriously concerned the border issue could be a failed promise and not a rallying point for his base. 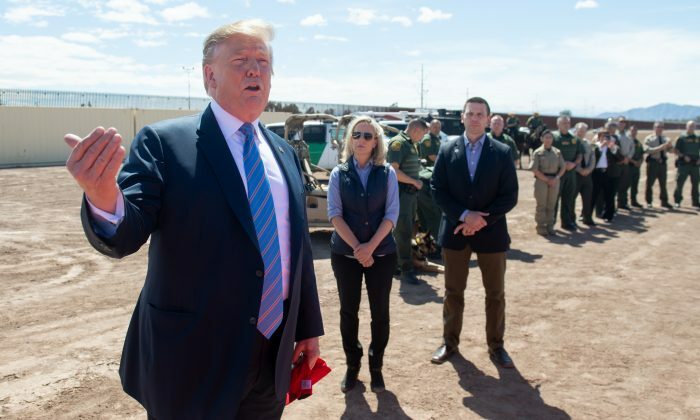 Conditions in Central America, such as drought, poverty and criminality, and America’s booming tight employment economy and well-organized migrant smugglers, have produced record surges to the border in spite of Trump’s use of the army and various immigrant deterrence tactics. Kelly was replaced by the Freedom Caucus’s founder, Mick Mulvaney. Stephen Miller was rumored to be behind the changes. No doubt, the next heads of Homeland Security and ICE will be seen as least as “tough” on immigration enforcement as those two. President Donald Trump, next to Kirstjen Nielsen, speaks with members of the U.S. Many of the populist/nationalist candidates who have changed the politics of Western Europe and America are now the dominant participants in a series of elections around the world. Most of the leaders are authoritarian in orientation and some are actively undermining rule of law, independent judiciaries and free press. Many of the countries have high levels of corruption, especially by wealthy business patrons of the governments. April will be a busy month with elections in India and Israel. In May, the EU will have parliamentary elections in all 28 member states. Right-wing populist movements will be active. Chicago Voted for Change. Is Denver Next?